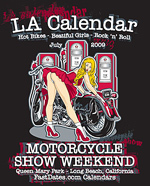 The Los Angeles Calendar Motorcycle Show's Pro Builder Class separates the Professional Builders from the Amateurs, and gives up and coming new builders the premier place to showcase their talents in front of the motorcycle industry. 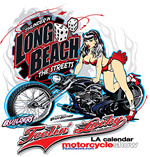 Every year, every Pro Class winner at the LA Calendar Motorcycle Show has gone on to have their bike featured on the covers and inside national motorcycle magazine, and in the prestigious Iron & Lace Motorcycle Pinup Calendar together with many of America's top builders. 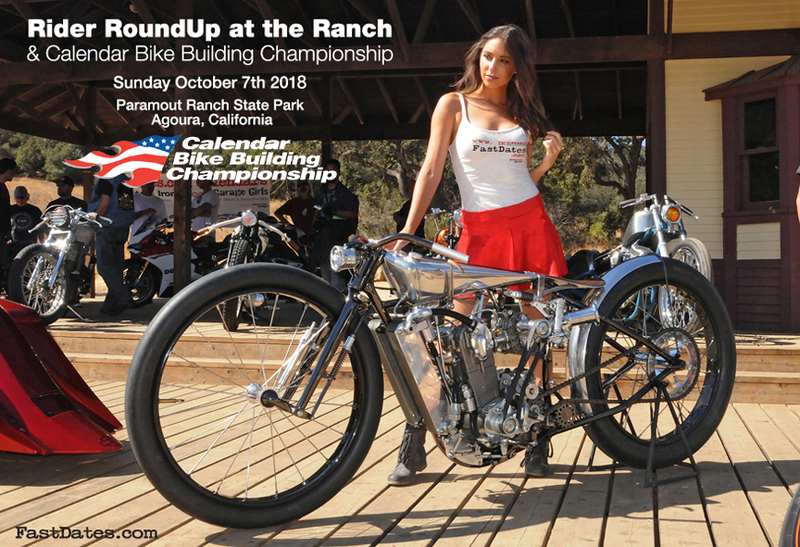 Rider RoudUp at TheRanch featuring incredible Professional and Amateur built motorcycles. The PREMIER CUSTOM & SPORT BIKE CONTEST on the WEST COAST! 2018 BIke Contest Pre-Registration Online is $40 which incudes (1) $20 Admission for Bike Owner. Additional Contest Bikes for the same Owner are $15 each. Additional Guests / Spectators can pay the $20 General Admission at the gate day of the event. Bike Contest Load-In 10am. Spectator viewing 11am - 5pm. Trophy Presentation and Media Photography 3-4:00pm. All Contest Bikes must remain in place until the Close of the Show at 5 pm. Iron & Lace and Fast Dates Calendars, and are submitted and featured in the world's leading motorcycle magazines including Bike Craft, Hot Bike Hot Bike Baggers, Street Choppers, Easyriders, Cycle World, Motorcyclist, Cafe Racer, Streetfighters. Monday the 8th after the Show to appear in Motorcycle Magazine features, and the FastDates.com Calendars and Website..
Builders / Owners are free to enter any motorcycle in any class as often the lines are blured between Pro and Amateur custom and collector bike styles, designs and classes. and the oppotunity to win an award in a different class. 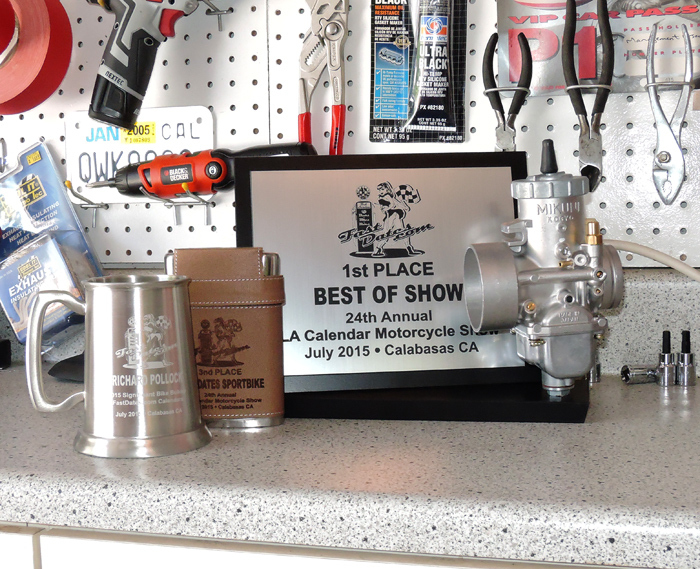 this year's LA Calendar Show features stand-up display plaque trophies with functional Mikuni VM38 Motorcycle Carburetors provided by our Iron & Lace Calendar sponsor Mikuni American with the carbs mounted on the bases for Best of Show and 1st Pla ce awards in all 6 classes. The 2nd and 3rd Place awards in all 6 classes are embossed leatherette cases on aluminum whisky flasks - perfect for trophy case display or carrying your favorite refreshment on your next ride! 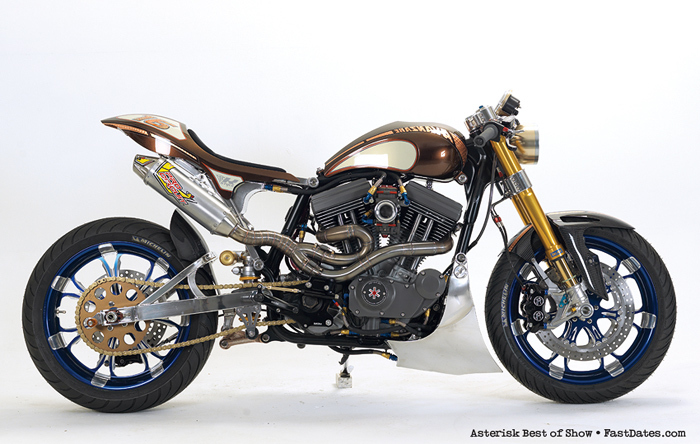 Harley Sportster cafe racer. Same also awarded a Mikuni Carburetor Kit of his choice. Calendar Show Winners Featured In Bike Craft Magazine! 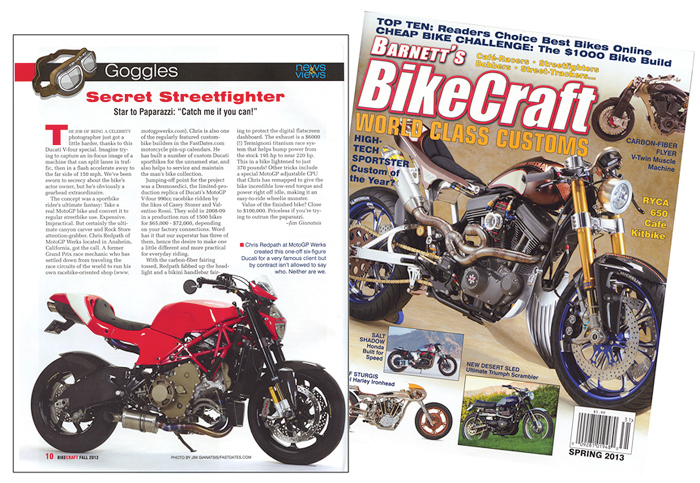 Three of the top winning bikes at last year's LA Calendar Motorcycle Show are featured in the Spring 2013 edition of Barnett's Bike Craft magazine, one of the Calendar Shows new media partners together with Thunder Press, Hot Bike, Hot Bike Baggers and Street Choppers magazines. Can you guess what kind of bike AFT is building for this year's Calendar Show? 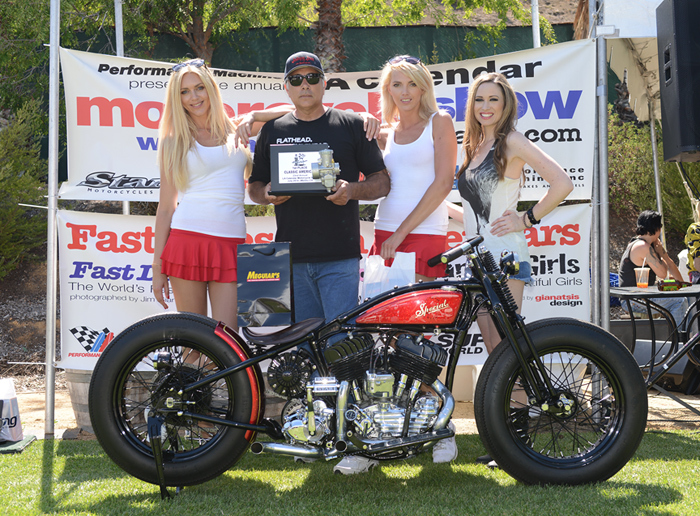 7-time Show winners Jim Giuffra and the spokesmodels at AFTcustoms.com are hard at work on their latest custom bike build Cimeron premiering at the LA Calendar Motorcycle Show in Malibu on Sunday July 20th. 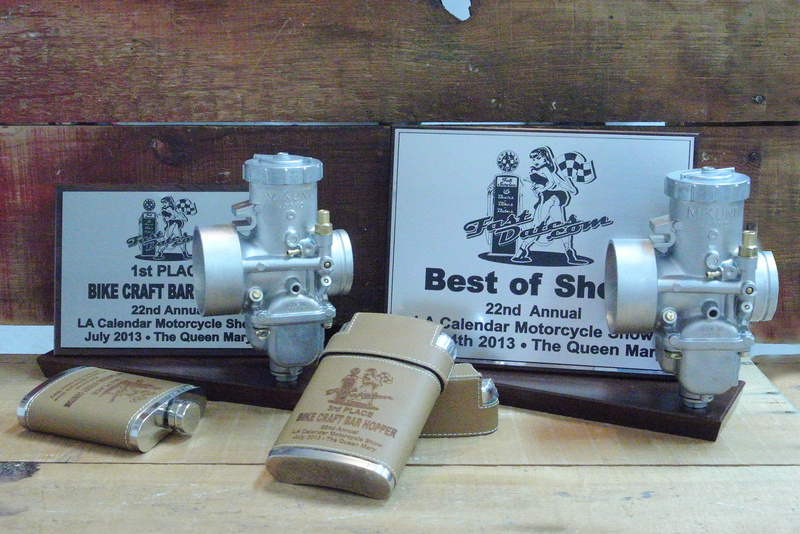 And don't forget their special AFT Visionary Trophy Award presented to the most innovative new custom at the Show. & Performance Street Bike Show in America! for the next Iron & Lace and Fast Dates calendars. Due to the current down in the economy and the loss of many Manufacturers, Sponsors and Venders at all bike events across America, including the Calendar Motorcycle Show, our cash awards have been eliminated since the 2010 Show. We will still have our great Trophies and Product Discount Award Certificates from our manufacturers in attendace at the show. Meanwhile, thank you for your continued support of the Calendar Show during the current difficult recession. Gianatsis Design will photograph selected top winning bikes photography for the Iron & Lace Calendar and Motorccyel Magazine Featurees in Cycle World, Easriders, and other Magazines. Normally the Monday following the Sunday contest is set aside for photography of the winning bike at the Gianatsis Design studio in Woodland Hills, CA. will be judged by Jim Gianatsis and other respected industry professionals and celebrity builders based on their personal tastes for design, execution and creativity. There will be no score cards or points awarded and all decisions are final. 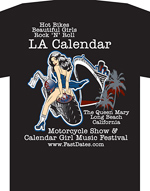 LA Calendar Motorcycle Show and the FastDates.com Calendars for high standards of originality and creativity and function. Contestants are responsible for choosing the correct class for their bike, and No Contest Entry Fees will be refunded. Paul Yaffe was one of the many celebrity Iron & Lace Calendar builders who gave Show Seminars. Above: 2002 & 2003 Best of Show winner, 2004 Best Pro Builder - Jesse Rooke.